You made a great software!, but I have specific monitor configuration - two separate work environments (not expanded desktop). $DISPLAY variable on first monitor is equal “:0”, and on the second “:0.1”. 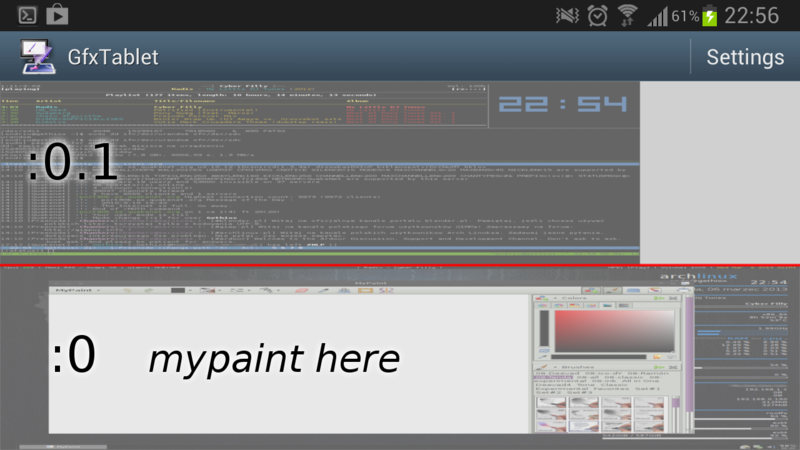 How works GfxTablet on the phone?, like cut horizontal line in the middle of the screen, and i can only working on one half of screen. I hope is possible solve this problem. I don’t know about your specific configuration. The network tablet should behave just exactly like a real tablet (only that its controlled via the app). So maybe you can find how to use a real graphics tablet on two separate X screens. Maybe disabling the tablet on the :0.1 display in the Xorg configuration helps. Or maybe you can use a TwinView configuration instead of two X displays?